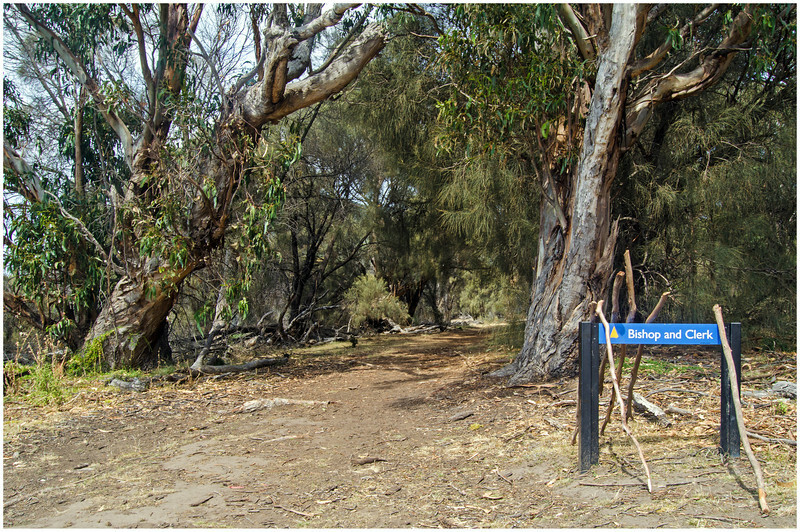 How to get to the Bishop and Clerk hike on Maria Island? 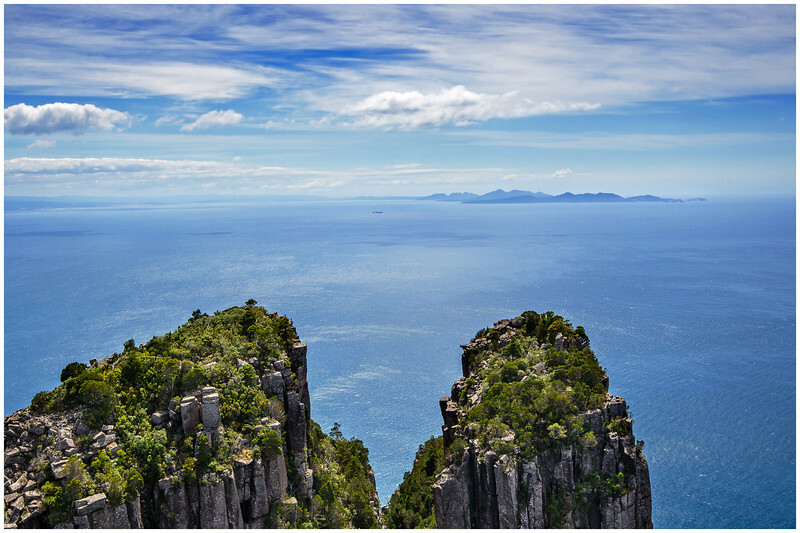 This Bishop and Clerk hike takes a little bit more effort than your average jaunt through the Tasmanian wilderness! Maria Island is exactly that…an island. If you’ve got the cash to burn then you can catch a charter flight across. If you’ve got the forearms of Popeye and sinews of steel then you can kayak across the Mercury Passage. However most ‘normal’ people will take the ferry from Triabunna. Triabunna is only an hour’s drive from Hobart so before you know it you’ll be standing on the jetty making a decision as to which of the two ferry companies (Maria Island Ferry or East Coast Cruises) you would prefer to use to take you over. Costing $35 return for an adult regardless of which company you choose, the only tangible difference is that East Coast Cruises is a little bit quicker, but a little bit smaller (which may matter to those wanting to bring lodas of camping gear across). After a 30-40min ferry ride you’ll find yourself docking at the gorgeous Darlington jetty on the northern tip of the island. From here, simply follow the main track past the registration building (making sure you have your Parks Pass with you!) until you see the sign at the top of the hill directing you to the left (east). Following this dirt road for just under 1.5km you’ll find yourself at the edge of an absolutely epic cliff face looking north across the water towards Freycinet National Park, with a large grassy hill to your right. Following the dirt track up the steep hill, cliff and stunning water views to your left, after 10-20mins (depending on your fitness level!) you’ll find yourself at the start of the track proper. All the way you’ll be able to see the jagged profile of your destination, Bishop and Clerk, in the distance. If you were really fit you could have ridden your bike to this point and continued on for some way up the track, but most leave their bikes at the bottom of the hill. Stepping into the trees, the broad path continues for around 1.5km before narrowing. For me, other than the summit this was my favourite part of the walk. 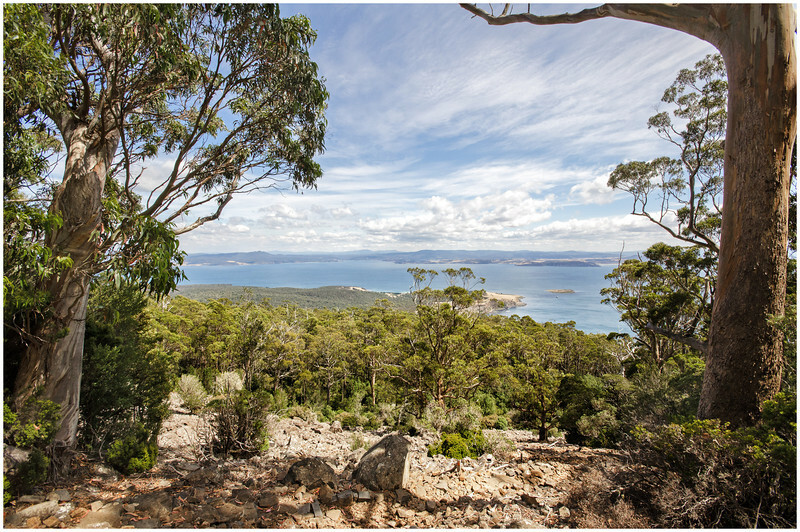 The views through the trees to the left are amazing, with Freycinet and the deep blue water making regular appearances. It was blowing a gale as we climbed the hill at the start of the walk, yet the scattered trees acted as a baffle, resulting in a delicate breeze that cooled us down as we worked up a sweat. After narrowing, the trail continues through the bush before eventually opening up again at the base of a large section of jumbled dolerite boulders. I’m guessing that from the time we passed the blue sign it took us around 45 minutes to get here. A short rest and a drink of water later and we were off again, scrambling over the rocks on all fours on some occasions, following the occasional rock cairns to ensure we didn’t go off track. Looking back over our shoulder the views were becoming better and better with each gain in altitude. The last 50 metres or so proved to be surprisingly difficult. The boulders by this stage were absolutely massive, with some sections requiring a high level of agility to clamber up, over, between and around the monoliths. One ledge in particular I recall was particularly difficult, with very few hand holds available to pull yourself up over the edge of the rock shelf, and a fairly long drop if you happened to slip. In the wet this would be downright dangerous!! After two hours of hiking we eventually hauled ourselves up the last few dolerite steps, to be greeted by sensational 360-degree views around Maria Island. Finding a sheltered little nook behind one of the rocks, we enjoying a well earned lunch before relaxing under the warm sun and eventually making our way back down the way we came. Final thoughts on our hike to Bishop and Clerk? 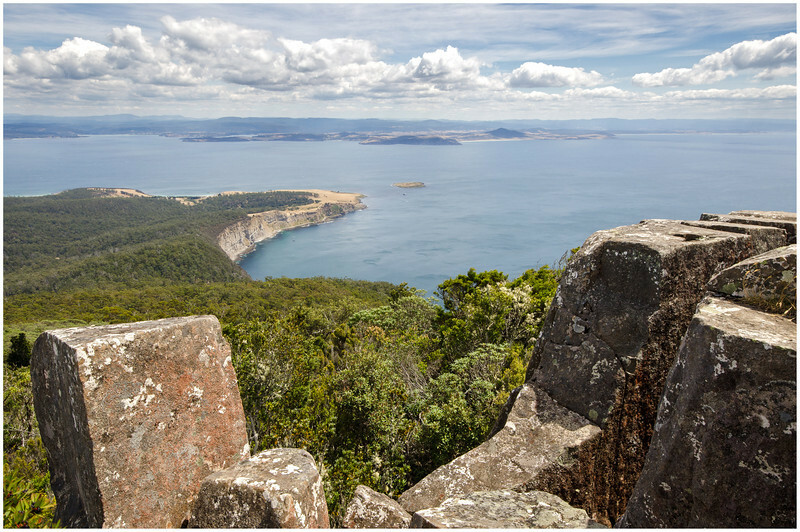 This Maria Island walk has plenty for everyone! 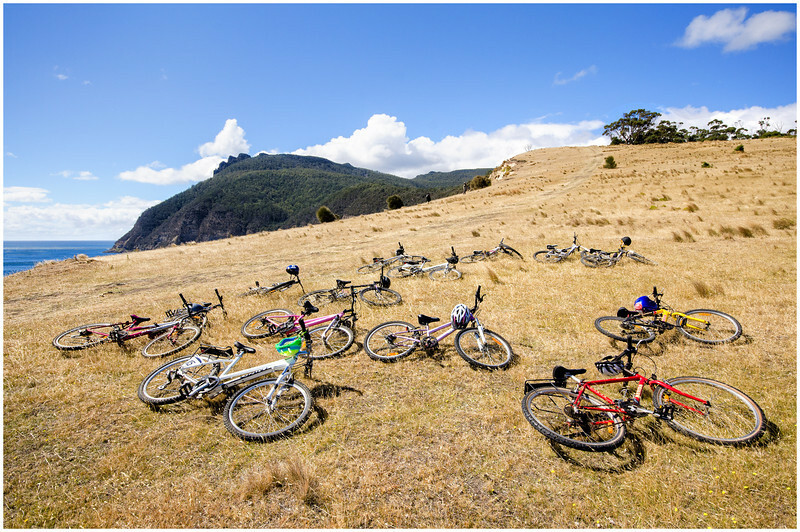 Those with limited fitness may feel a great sense of accomplishment simply reaching the top of the grassy hill, or perhaps pushing on until the track narrows. Those who are unsure on their feet when rock-hopping or suffer from a touch of vertigo may like to stop at the base of the boulder slope. And those who enjoy a good, yet not overly difficult hike, will find themselves thoroughly satisfied with the incredible views at the top of Bishop and Clerk. While it was tough towards the top, the fact that a bunch of school children had ascended the peak half an hour before us was enough to keep our confidence levels high! In total this walk took us around three and a half hours. If you haven’t hired a bike you will need to add on perhaps another 30 minutes each way to get to and from Darlington. It’s the perfect length for anyone visiting the island as a day trip, with the ferry typically leaving around 4:00pm. We loved this walk, and the reward to effort ratio was massive! Looking for more articles about Maria Island? Mt Maria hike – This walk up Mt Maria is tougher than Bishop and Clerk, but the views of southern Maria Island are spectacular. Day 4 on Maria Island – Penguins! Loved your account, great short hike and fab views, we set off early to avoid crowds, only saw two others on ascent but heaps on descent. Best in dry conditions. Worth it for views, not recommended for those with knee issues. Dolerite, not granite 🙂 Those columnar formations are the same type of rock (dolerite) and process that form the Organ Pipes on Mt Wellington at Hobart. Conquered this peak at the start of a three-day walk around Maria Island 🙂 Probably slightly better “Value for Effort” than Mt Maria, although both peaks are worth climbing! I have to agree Oliver. The final views from Mt Maria are stunning, but the walk up B&C is so much more interesting all the way up. Glad you enjoyed your time there – it’s a fantastic corner of Tasmania that doesn’t get anywhere near as much attention as it should (probably a good thing though! ).